Colorado Springs, CO – 22 May 2013, PhotoWeb the best-in-class hotel photography, video production and syndication company has developed a 2D and 3D Rendering Design solution that has helped B. F. Saul Company go beyond selling rooms, to selling a proposition; increasing brand loyalty and improving the appearance and usability of its hotels. The SpringHill Suites by Marriott Boca Raton hotel, owned by B. F. Saul Company Hospitality Group, is one of the first hotels to begin using 2D and 3D dimensional designs on their website. 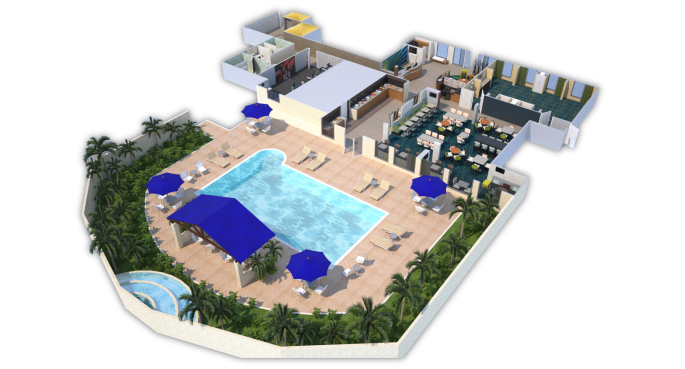 Normally associated to architectural projects, 2D and 3D Rendering Designs are also effective online marketing tools, helping hotels to illustrate the layout and size of bedrooms, conference rooms as well as showcase an entire hotel/resort from a bird’s eye view. Visualizing the entirety of a hotel was particularly important to SpringHill Suites, as its close proximity to its sister hotel TownePlace Suites by Marriott and its combined offering, had been a difficult proposition to convey online – customers had the choice of 4 or 5 different room options across both properties, which occasionally caused confusion. David Attardi, Vice President, Interactive Marketing at B. F. Saul Company says, “Our sales teams tell us the designs are incredibly valuable helping them to better relay the hotel’s value proposition, thereby increasing the extended stay opportunity”. SpringHill Suites has taken Rendering Designs to an even greater level, using the 3D designs to visually demonstrate what the hotel will look like after its $1 million plus renovation project to its public spaces. It is displaying the designs on its SpringHill Suites website and physically in its front lobby to provide complete transparency to its valued customers. Further still, the 3D Rendering Designs have helped the management team at SpringHill Suites identify opportunities to improve the physical layout of the hotel, as the designs showed them where existing walls and corridors were not adding value and hindering some of the public spaces. Andrew Meli, CEO of PhotoWeb is delighted that its 2D & 3D Rendering Designs are helping to increase business for B. F. Saul Company’s hotels. “David and his team saw the business value of the designs and have leveraged its uses beyond selling rooms, but to selling a proposition. We believe these designs complement other digital imaging solutions such as still photographs, virtual tours and videos, helping site lookers to further visualize the hotel and its facilities and make an informed booking”, says Andrew Meli, CEO of PhotoWeb. PhotoWeb is the premier hotel resort photography and video production company for the hospitality industry worldwide. PhotoWeb’s clients include some of the finest hotels and best-known brands including Raffles Hotels, GHM, Oberoi, Taj Hotels Resorts & Palaces, Swissôtel, Starwood, Hilton, Marriott and Millennium & Copthorne.